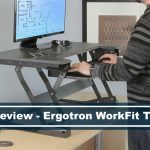 Can I use a standing desk converter? How big should an executive desk be? What is the difference between a regular desk and an executive desk? Why are executive desks so expensive? Can I use an executive desk for gaming? Did you get a promotion or a new job? Or you’re just upgrading your home office? 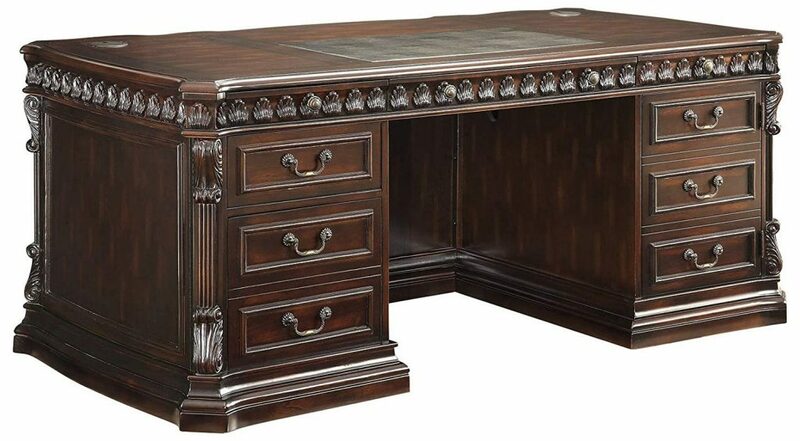 Either way, an executive desk is a perfect furniture piece that will last you a lifetime. It’s more than just furniture; it’s a statement. These are sophisticated, high-end, and a portray of power and importance. They give a particular style to your office, a style that no other desk can provide you. What’s so special about them? They’re made of wood and are large and bulky. Most models are stylish and shiny, so people often keep them at the center of the room. Buying such a desk isn’t a simple task especially because you’re trying to send a message with it. 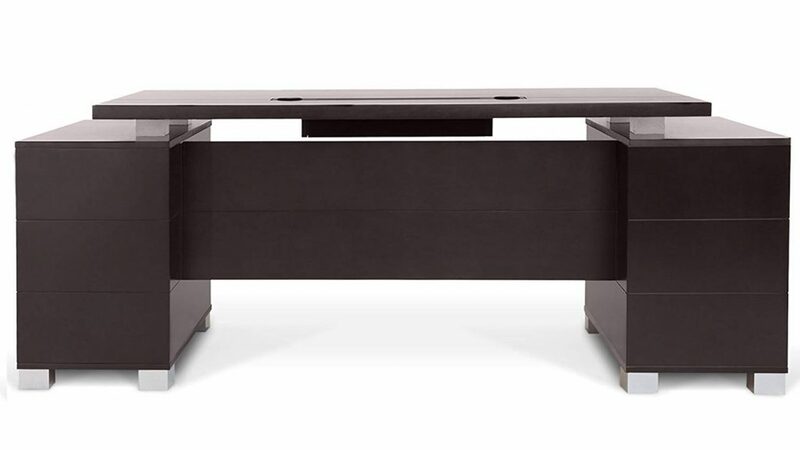 We researched to find the best executive desk, so we made a list of a few models that stand out on the market. Read the reviews while considering your preferences and needs so you can choose the one that’s best for you. These are elegant and never go out of style, which is one of their most significant benefits. However, there’s more to it than just looks. Longevity is also worth noting since these can last a lifetime. Almost every executive desk is large. This means plenty of room for your work, documents, laptop, photo frame, phone, etc. Plus, every high-end model has a number of drawers that are ideal for all your work-related items and documents. So, the benefits are high-end and prestigious design, solid construction, longevity, and lots of space on the top as well as in drawers. This is among the best choices for those that have a large office and need lots of space to work on. It measures 26x66x29.5 inches, the credenza measures 29x66x19.5 inches, and the bridge table is 29×46.4×19.5 inches. The entire bundle comes in four separate boxes. It’s a U-shaped with hutch bundle that includes a desk, bridge table, credenza, and Hutch. Though it looks the best in a large office, the U shape makes it easy to use in smaller space as well. The hutch is especially convenient as it allows you to save space in your office. Its five small cubbies and the shelving space provide enough room for all the items you want to keep at hand. It has a fabric pin board across the bottom. The bundle has a two-tone finish in gray and cherry, so it matches almost any décor. This might be the best choice if you’re looking for something a bit more modern. It’s large and has lots of space, but the overall look is more modern than most other models. It measures 79x32x29.5 inches in total, while the desktop measures 63×31.5×29.5 inches. This vast space is ideal for large offices and people who need a lot of surface for their work. However, it’s suitable for architects, lawyers, professors, and everyone else who needs and loves a big desk. This one has silver painted wood feet that are quite wide. They’re stable support to the table, so the entire construction is solid and very difficult to move. It has four locking drawers with two for letter or legal filing. It comes in a smooth dark walnut veneer finish that gives it a touch of sophistication. The sharp lines and the overall shape make it as modern-looking and different than others. This contemporary piece has a left return, but you can order it in right return configurations as well. It depends on which side works best for you. It has a dark walnut finish with silver sides that were custom painted, and powder coated metallic. Its overall dimensions are 83x39x30 inches for the desk and 63×17.7×24 inches for the return. The leather writing pad measures 35×19.5 inches in total. It’s also important to note that it has two portholes for phone and monitor cables which is something you don’t often see with these tables. It looks the best in large offices, but you can fit it in smaller areas as well thanks to its L shape. It’s heavy enough to be stable, but still light enough to be pushed around the room. The drawers and shelving areas are ideal for all your documents and even some bulkier items. It also features two large cubes where you can store some smaller boxes or books. If you’re into something more old school, you should definitely check out this Coaster Home Furnishings desk. It’s massive, heavy and looks quite elegant and luxurious. It’s made of poplar wood, cherry wood, plywood, and MDF. It requires no assembly as the entire thing is made as one piece. The color is shiny, rich brown that goes well with bookshelves and other executive furniture. It has a full extension glide and the top drawer-felt lined as well. The desk features five drawers in totals including the file cabinet and keyboard drawer. It has a CPU with adjustable shelves. Drawers don’t have a lock. All knobs and bail handles are made of metal, but they go well with the style. They’re also quite durable and won’t show signs of use any time soon. It measures 72x36x31 inches, and it’s one of those that will last you a lifetime thanks to its sturdy construction and quality of materials. 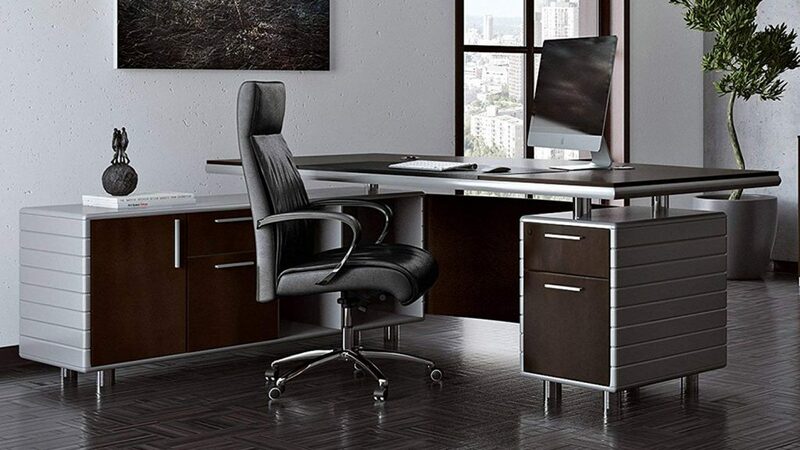 Not all executive desks are made for large offices, so don’t get discouraged if you have a smaller one. This pedestal model is ideal for small areas, but it still looks massive the way executive desks should look. It’s made of wood and has a multi-step, hand-rubbed espresso finish on all its hardwood solids and veneers. One of the most convenient things about this one is its convertible keyboard/pencil drawer that’s ideal for your laptop. It also has another two utility drawers for smaller items and office supplies. One of them has removable dividers for better desk organization. Behind a cabinet door is the pull-out printer tray/CPU storage. The file drawer locks for some added security so you can store some valuable files and items. All drawers have full precision channel joints and suspension ball bearing glides. When it’s fully assembled, the desk measures 30x61x23.25 inches. These are usually massive. They’re large, heavy, and almost impossible to move around. This is due to the materials used to make them. Most are made of some kind of solid wood and might even have metal pieces like knobs, feet, etc. Its drawers, slides, shelving space are also made of the same materials and quite heavy. All of those components add to the overall weight. Look for the one that’s made of solid wood as its primary material. It should be sturdy and last for years to come, so the choice of materials determines the overall quality. Another thing you want to pay attention to is if it’s built in one or more pieces. Some larger ones are in two or three pieces so make sure to check how the pieces are brought together. These seams are where your desk might break if the construction isn’t stable enough. These are large and will take up much of the space in your office. For this reason, you want something that’s as good looking as it’s efficient. However, the style is always entirely up to you. Think about your personal style and the décor of your office. There are plenty of choices on the market, so you’ll find whatever you’re looking for with ease. L- and U-shaped models are a recent trend, but the styles provide additional space for your needs. Plus, you’ll have to choose between more traditional and modern as well. Other things you want to pay attention to regarding style are the drawers and storage cubes. These can make or break the entire look because they have to look good as well as be efficient. Regardless of how big the office is, you don’t want any piece of furniture to overpower it. Even if you choose your desk to be the centerpiece of the space, you still want enough room for other things. For this reason, it’s important you measure the room and think about how much space you want the desk to occupy. If it’s too large will leave little space for other furniture in the room. On the other hand, if it’s too small, it might also not provide enough space for your work. It’s up to you to decide once you think about the area and what you want to accomplish. It’s important to note that not every desk will fit your needs just because you like the style of it. Some don’t fit the size you’re looking for, while others might not have enough storage room. Plus, people have different needs in terms of storage and an overall top surface. The best way to decide on this is to think about the job you’ll do on it. Do you have a lot of documents you must keep at hand? Do you have large items and office supplies? Ask yourself how much space you think you’ll need. Some people don’t need as much table surface but need lots of drawers and shelving space. Others, however, need as much space as possible for computers, papers of large sizes and other such things. Think about if you need a large surface area and consider the storage you’d be happy with. 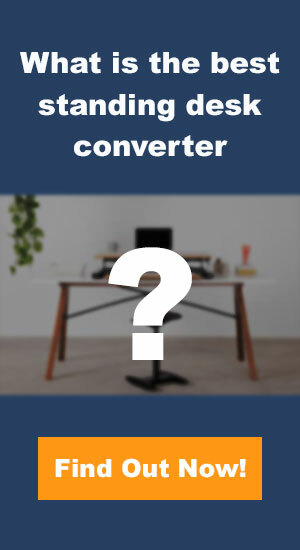 Although there’s no concrete yes or no answer to this question, we think that you can certainly add a standing desk converter to an executive desk. 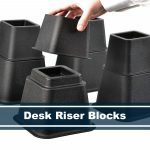 You may think that it will damage the desk or make it look less executive, but we think that finding the right standing desk converter can make it more elegant. The standing desk converters have rubber pads on the bottom to prevent your desk from getting damaged. And besides, these converters are great for your lower back pain. It has to be big otherwise it will look like a standard office desk. Its size and materials make it an executive desk, so only large dimensions count. However, the precise size depends on your needs and preferences. As we discussed above, you have to think about several factors in order to determine what size would work the best for you. Once you consider the size of your office and what would work the best for your needs, you can go on and select the desk dimensions that would fit within that. The main difference has to be in size and storage space. 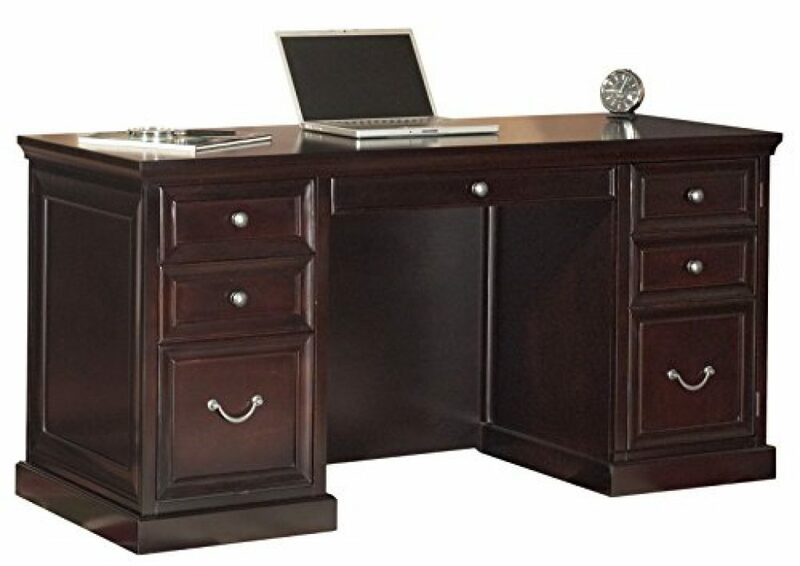 An executive desk is more massive and has more storage space than a regular model. These are wider and deeper and have full pedestals all the way to the floor. Executive desks also have a full modesty panel at the back. They have drawers, storage cubes and are the best choice if you want a large work surface. Regular desks are relatively small and may or may not have some drawers. It’s best for people who don’t need as much storage space and have an office that’s more on a small side. The most common reason for their high price is the choice of materials. Most of these pieces are built from solid wood and a lot of it. They are big in size, so it takes lots of materials, effort and time to build one. They might seem pricey, but a quality piece will last you a lifetime. Think about that and the price will make more sense to you. An executive desk should look prestige, and it shouldn’t be crowded and cluttered with gadgets and gaming monitors, because it’ll disrupt the entire look of the desk. 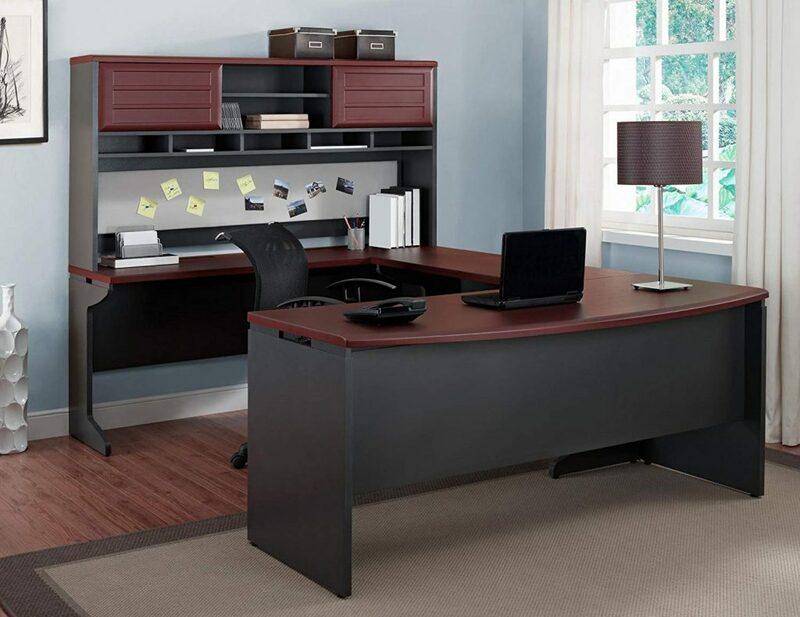 However, executive desks have a lot of storage units that are great for gaming accessories that can be put away. If you’re using a laptop for gaming, then we don’t see why you couldn’t use an executive desk for gaming. But because these are usually meant for working, it’s better to keep these accessories away from distractions. If you’re looking to make a statement with your office furniture, the best way to do it is by getting an executive desk. These are ideal for large spaces and people who need lots of storage. You’ll see lawyers use them as well as architects, doctors, CEO’s, and everyone else in need of a large work surface. Not only it’s an elegant and everlasting option, but it’s convenient. Luckily, these desks come in many shapes, styles, and sizes so it’s easy to find what would fit you the best. Think about the critical factors such as your needs and the size of your office before you make a final decision. We’re sure one of the models above fit within what you’re looking for.